It’s important to know that the new travel tickets must always be validated in the new validating machines every time one gets on board and, at any change of mean of transport. The second validation will for the time being only have a statistic value and the travel ticket will remain into effect until its validity date. They allow you to travel on board of more than one mean of transport in the area marked on the ticket. They must be validated as you get on board in the provided validating machine. The time limit of the travel is marked in minutes next to the sign (clock) and it will start from validation time (printed on the back by the validating machine). 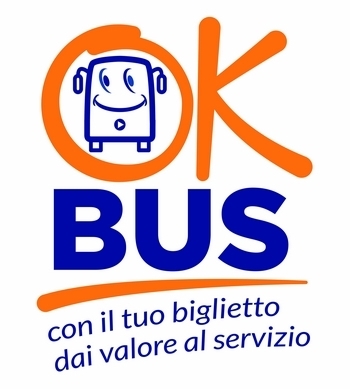 From June 2018 is on sale the new single journey bus ticket for the urban area of Rimini, it costs € 1,50 and is valid for 75 minutes after it has been stamped. It’s required to travel between the five Rimini’s urban zones (900 - 951 - 952 - 953 - 954). Read more in this page. Each area has a different colour in order to distinguish tickets at first glance. Follow the colour and find your areas! Single ride tickets with an extra charge can be purchased on board by the bus driver and at the ticket machines on board, if present. They allow you to travel with all means of transport within the areas marked on the ticket. They must be validated as you get on board in the provided validating machine. New multi-journey ticket, called Carnet 10 corse, it’s a magnetic stripe ticket valid for 10 journeys and it can be used by several people at once, validating the ticket for each person, maximum 7 contemporary validations. 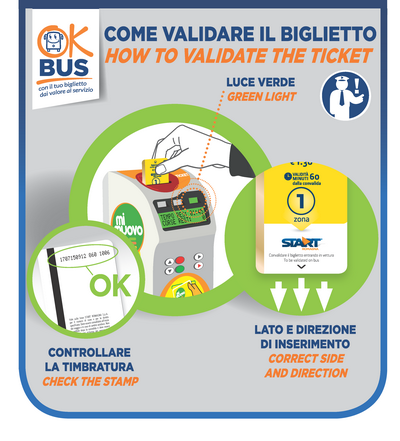 With the validation, your ticket will be printed with date, time, zone and number of the bus. This allows you to check immediately both the residual minutes of your ride and also the remaining journeys, and it’s useful in case of an inspection of authorised staff. 10-journey ticket allows you to travel on several bus lines within validity time of the travel ticket, as long as the route is entirely included in such areas. The ticket must be validated each time you change the bus line, no more journey will be payed and beside the validation will be printed a letter "C". The 10-journey ticket is available from 1 to 5 zone. Old multi-journey tickets can be used until stocks run out. Valid 24 hours from the moment of validation (time printed on the back from the validating machine) within the areas shown on the ticket (see the example here below). Day Ticket 24 hours makes it easier to travel and is more convenient compared to the purchase of two hour-tickets starting from the 3rd area. To be valid, Day Ticket must be filled in by the user, who has to write the starting area number, as well as the destination area one. * The 1 area Day Ticket is not valid for the Rimini area, use the 2 areas Day Ticket (€ 4.50). Ticket must be validated as you get on board in the provided validating machine. Irregular use and / or ticket counterfeiting is punishable by law.